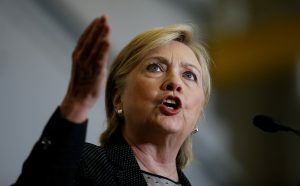 WASHINGTON — Hillary Clinton offered a selective accounting of her history on trade Thursday, leaving out her support for initiatives that have since become unpopular. She also offered a rosier view of the U.S. workforce than the numbers portray. THE FACTS: Actually, bar two. Luxembourg and Norway have more productive workforces, according to the Organization for Economic Cooperation and Development. More concerning is the fact that U.S. productivity has been slipping in recent years. Productivity, or the amount of output per hour worked, is a measure of how efficient an economy is. The U.S. is third in the world, says the OECD, a group of mostly rich countries. But American productivity has been extraordinarily weak since the recession began in December 2007, a trend that could weigh on economic growth and incomes. Higher productivity makes it possible for employers to pay their workers more without raising prices. Productivity fell 0.4 percent in the April-June quarter compared with a year earlier. That was the fourth time productivity has fallen from a year earlier since the recession began. Before that, productivity hadn’t fallen since 1993. THE FACTS: She didn’t oppose the Pacific deal when she was secretary of state, but rather promoted it. In 2012, during a trip to Australia, she called it the “gold standard” of trade agreements. She flip-flopped into opposition in the Democratic primary when facing Sen. Bernie Sanders, who was vehemently opposed to it. Clinton says she no longer backs the proposed trade deal as written because it does not provide enough protections for U.S. workers on wages, jobs and the country’s national security. Over the years, she has opposed some trade deals and supported others. Two that she backed are the source of contention in her 2016 race with Republican Donald Trump, just as they were when Barack Obama called her out on them in the 2008 Democratic primary campaign. For years before that campaign, Clinton repeatedly defended the North American Free Trade Agreement, which her husband shepherded through Congress in 1993. As first lady in 1996, she said “NAFTA is proving its worth.” As a New York senator, she said the agreement was good for the U.S. “on balance” and her 2003 memoir voiced the conviction that the deal with Canada and Mexico was the right step. While campaigning for the Senate in 2000, she also expressed support for her husband’s initiative normalizing trade with China, despite her concerns about labor rights for Chinese workers. She said, again “on balance,” that it was in the interest of U.S. workers to have China open its markets to more U.S. goods. THE FACTS: This may be true, but it shouldn’t have been a surprise. Most trade deals the U.S. agrees to, including NAFTA and subsequent agreements like the Trans-Pacific Partnership, include “investor protections.” These are legally binding provisions that are intended to reassure companies that if they set up shop overseas, foreign governments won’t be able to seize their assets or use regulations to hurt their businesses. Not surprisingly, many companies have taken advantage of those rules to shift their operations abroad. READ MORE: How does Donald Trump’s economic plan hold up? THE FACTS: First, Clinton persists in citing a former McCain adviser — the respected Moody’s Analytics economist and forecaster Mark Zandi — without mentioning that Zandi is a donor to her campaign. As well, she did not fully capture what Zandi estimated when she quoted him as saying her plans would add 10 million jobs. Zandi actually estimated job gains of 7.2 million in the next presidential term if there are no policy changes. He estimated her plans would add 3.2 million jobs to that baseline. She’s taking credit for jobs expected to grow even if the economy were essentially on auto pilot. Further, the analysis Clinton quotes for Donald Trump was released in June, so it doesn’t account for revisions in his economic plans, such as his intention to make the top marginal tax rate for individuals 33 percent, instead of the 25 percent analyzed by Zandi. Still, the outdated analysis says that there would be fewer jobs after four years of a Trump administration than exists today. Also worth noting: Most forecasts are extremely speculative and seldom correspond with what really happens in the economy.